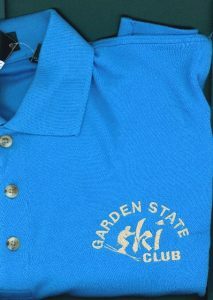 Now you can order quality sportswear that proudly displays the Garden State Ski Club logo. Prices range from $20 (for the gear/helmet bag) and up, depending on the style and the embroidery requested. Standard Garden State Ski Club logo and a personal name or nickname (there is a letter limit for the name) are free. If you want a large Garden State Ski Club Race Team logo on the back of your vest or jacket, there is an extra charge—but well worth it! 3-week delivery time, so place orders now for holiday gift-giving! Keep your honey warm and stylish on the slopes with GSSC wear. To place orders and see samples, come to our table at ski club meetings. Any questions concerning colors, photos, sizes, full descriptions, can be found on the catalog website BODEKANDRHODES.com. Custom embroidery by a sheltered workshop benefitting ARC and each sale raises $5 to benefit GSSC. The sport/helmet bag style 0010 (forest green, navy, pink, red) or 0011 (with front pocket, in black only) from BodekandRhodes.com costs $20. Extra logo on back of any item costs $10 extra. The listing below is only a partial listing for illustration. The full list is available on the order form here. Pick up an order form at a ski club meeting, with your check payable to the Garden State Ski Club. More styles are available– a full list of colors and styles is available at the Tues. night meetings.